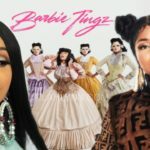 Tensions between Nicki Minaj, Cardi B and their entourages have been brewing for over a year now. 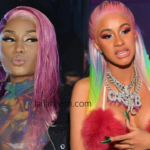 But last night the brew came to a BOIL when Cardi B approached Nicki Minaj at a New York Fashion Week event and threw her shoe at her!! 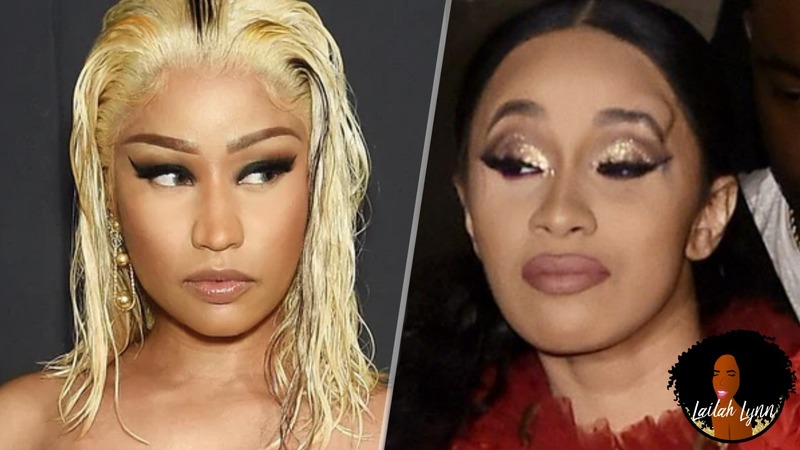 Some people are saying that Cardi B was fed up that Nicki Minaj said something about her daughter Kulture. But in the video you can hear Cardi B saying “Like something about my daughter again!” over and over again. Listen closely. 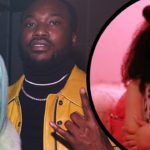 So this whole physical altercation was about Nicki Minaj LIKING a negative comment about Cardi B and her daughter. Which is crazy! To me, fighting is for animals! It’s the lowest of the low, and it’s what people do when they are at their worst. And I actually don’t blame Nicki for not wanting to physically fight Cardi B. Why should she stoop to her level? Let the dogs fight, and let the ladies be ladies! Anyway, I was able to track down the actual tweet that Nicki Minaj liked that set Cardi B off. Shout out to Naomi (@bellegrossier) for capturing this. The person who tweeted this was referring to Cardi B welcoming home Kodak Black despite the charges against him. 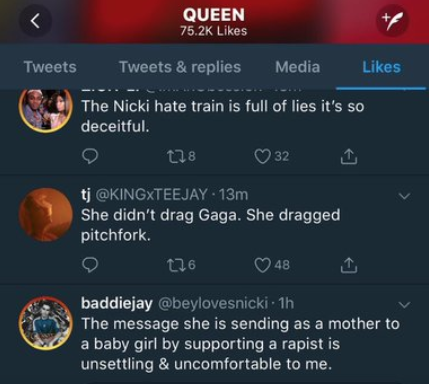 And because Nicki Minaj liked this tweet which says that Cardi is sending a message to her baby girl by supporting an alleged r a p i s t, Cardi B turned into an animal when she saw Nicki Minaj last night! Cardi B sounds less than smart in this post. Like she really didn’t know that Yes, it really is all for entertainment! It’s the entertainment industry. So yes, people talk crazy but when you see them in real life they are not trying to affect their career by fighting you! 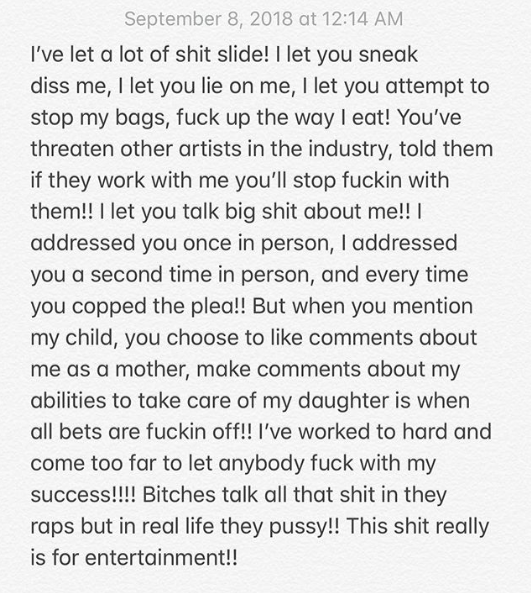 This is Cardi B’s second fight in the last two weeks. First she tried to fight that bartender and her sister who apparently IS sleeping with Offset. And now she tried to fight Nicki Minaj. 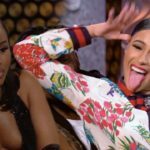 So Cardi B is becoming a liability! 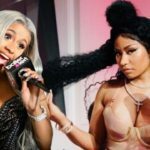 Leave a comment and let me know how you think Cardi B attacking Nicki Minaj is going to affect Cardi’s career? Do you think it’s going to mess up any brand deals she might have? 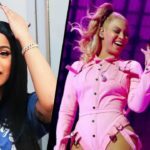 How do y’all think Cardi B is going to be affected?